A quick view of the most influential metrics in Chelsea Heights/Westchester Hills. Chelsea Heights and Westchester Hills are located northwest of the City of Decatur, partially within the city and partially in unincorporated DeKalb County. They are separated by Hidden Cove Park and within an easy stroll to the old-growth trees and walking paths of Fernbank Forest. A wide range of architectural styles are evident along the area’s rolling hills and curving roads. Chelsea Heights, in particular, has a historic feel and a mature canopy of oaks and pines. Both neighborhoods provide easy access to Emory, the CDC, and the Fernbank Science Center. View our selection of available properties in the Chelsea Heights/Westchester Hills area. 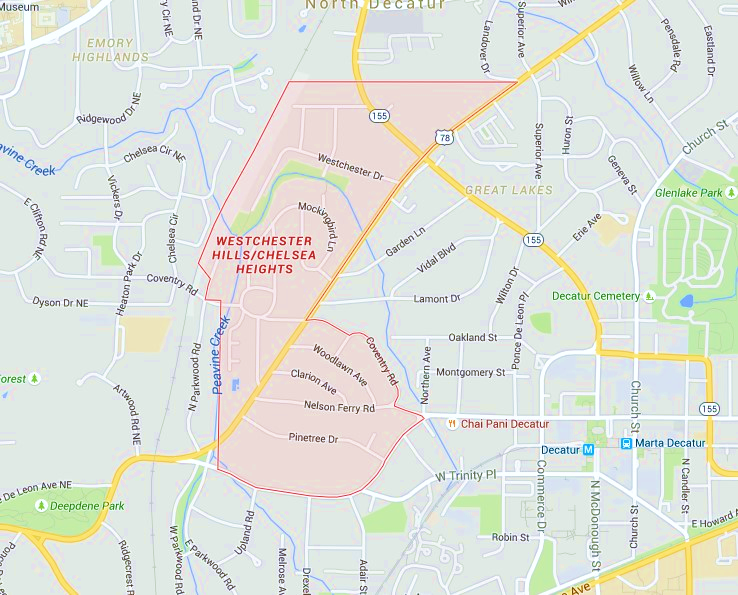 Check out the latest demographic information available for Chelsea Heights/Westchester Hills. Learn more about schools near Chelsea Heights/Westchester Hills complete with ratings and contact information. Browse through the top rated businesses in the most popular categories Chelsea Heights/Westchester Hills has to offer.